One of the easiest things you can do to spice up a drink is to add a little bit of garnish to the top. A dusting of chocolate or cinnamon can boost the flavor, as well as really enhancing the overall presentation of a drink. I like to put a sprinkle on my drinks just for fun, but I almost always do it when I’m serving family or guests. Ground spices and coarsely chopped chocolate work out nicely, but this pair of Chocolate and Cinnamon Mills makes the garnishing process a whole lot easier. 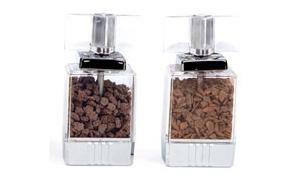 The mills function just like pepper mills, but are filled with chunks of chocolate and pieces of cinnamon. Both are refillable, so you can change up the type of chocolate or use a custom blend of whole spices, too.